Submitted by Taps Coogan on the 5th of April 2019 to The Sounding Line. Whether you want Brexit or you want to remain, leaving the EU but remaining in the EU customs union, so called ‘soft Brexit,’ offers no advantages. For leavers, staying in a customs union means that there can be no independent UK trade, regulatory, or immigration policy, nor independent courts. Claims to the contrary are not based in reality. There will, however, almost certainly be continued payments to the EU. It is Brexit minus every single thing that makes Brexit worth doing. For those that want to remain, the UK would lose its vote and voice in the EU. The UK would not be in the EU, not able to influence its policies, not able to protect its own interests, and not able to advance its vision for Europe. 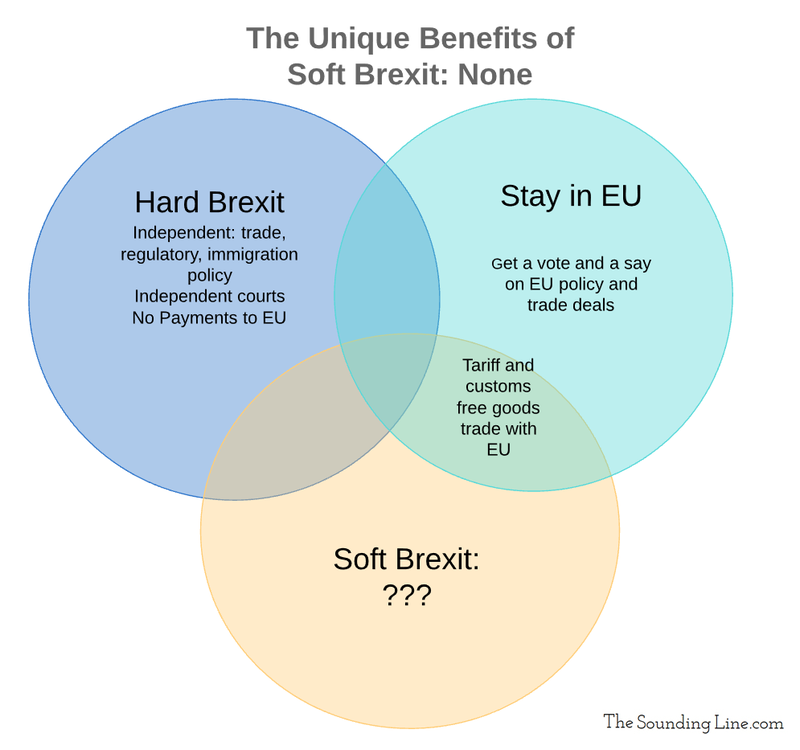 Compared to leaving or staying, soft Brexit offers only disadvantages. It is almost everything leavers and remainers dislike about each others’ plans, consolidated into one idea, all to protect a minority of UK goods exports, that have been stagnanting for 20 years, from an increase in tariffs. It is a bad deal, that is, unless you are a politician that has been trying to figure out how to remain, without being called out for it. The fact that it now appears to be the government and Parliament’s plan of action is tragic and, in my opinion, a historic political miscalculation. You are right, they are trying to save their compromised 6’s, not realizing that they will get taken out back and shot anyways because they are only going to make things that much more worse when a hard brexit can no longer be avoided.